Please understand that we are not discussing the responsible use of a tether to keep a supervised dog safe from harm. This article addresses the irresponsible ways in which some pet parents use a tether or chain on an unsupervised, neglected pup. Wyatt after amputation at 8 months old. 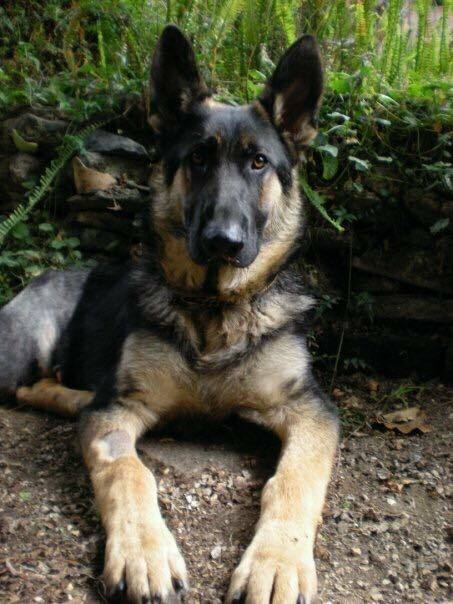 Our Tripawds Spokesdog Wyatt Ray did not lose his leg to cancer. And he doesn’t even hate his previous humans for their bad decision that altered his life forever. Wyatt wants you to help chained dogs. As a seven-month old puppy, Wyatt was chained up and left alone in an Oakland, California back yard. We don’t know if he was purchased from a breeder to be someone’s “Guard Dog” or if his former humans just didn’t understand the commitment required to train a hard-working German Shepherd. What we do know is that he was left outside on a chain and ignored. Who can ignore this face? The chain cut off circulation to Wyatt’s right rear leg. When his humans saw the damage, they quickly abandoned him at a veterinary clinic. Thankfully the compassionate vet and a kind-hearted nurse intervened, and after amputation surgery turned him over to German Shepherd Rescue of Northern California. With one less leg but more spirit than ever, Wyatt was finally free. Sadly, many unsupervised tethered dogs lose a leg the same way Wyatt did. 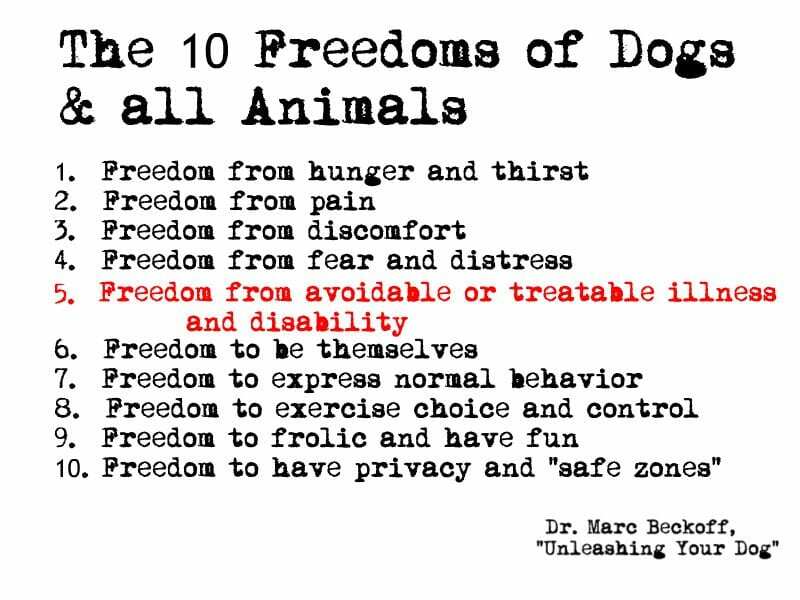 These dogs have been denied their 10 Freedoms of Dogs, which Dr. Marc Beckoff explains in his new book, “Unleashing Your Dog: A Field Guide to Giving Your Canine Companion the Best Life Possible.” (stay tuned for a review). Wyatt’s nurse recently sent us some never-before seen photos taken when she was caring for him. The mangled leg picture brought us to tears. It explains so much about the damage done to Wyatt’s psyche, and the great price he has paid to live as a Tripawd. This never should have happened to him, or any dog. If you know of someone who has an unsupervised tethered backyard dog, please show them Wyatt’s leg photo. Let them know this is what can happen to a dog left unsupervised on a chain. And as much as we all want to set unsupervised chained dogs free, it’s important to remember that most people who resort to leaving their dog alone on a tether all day really do care for their animal. They just don’t know what responsible dog parenting looks like. But you do, and you can help them become better pet parents! Let’s all work to help unsupervised tethered dogs and end the chained dog Tripawd syndrome at Unchain Your Dog and Dogs Deserve Better. Wyatt thanks you for taking action. Too many backyard dogs all over the world suffer at the end of a chain. In fact, last week we received a call on the Tripawds Helpline from someone seeking a Tripawds ASAP Grant, because they allowed the same thing to happen to their dog. In that dog’s honor, and Wyatt Ray’s we hope you’ll take action the next time you encounter a chained dog with nobody looking out for them. Thank you. That picture is so totally heartbreaking… and it is the grim reality of what happens when people are not responsible for their pets and treat them like second class citizens. I commend your attempt at responsible pawrenting… everybody that has ever chained a dog out should see what the outcome could be.. it could also be even worse. Having prior animal control experience I have seen everything from that to dogs getting themselves wrapped so tight around something that they could not breathe and nearly died.. to a little Scottie that was chained on to his owners deck and fell off the side while his owners were not home. These are things I will never be able to un-see. Wyatt, I am so glad your mom and dad found you!!! Jackie my heart aches for all that you went through in that role. You were an angel to those animals you tried to help. We have wanted to share this message for a long time now, just to let people know what can happen. I’m so glad you posted so that you can reinforce the message. Thank you for sharing your experience. Hugs & woofs back at ya from all of us but especially Wyatt!